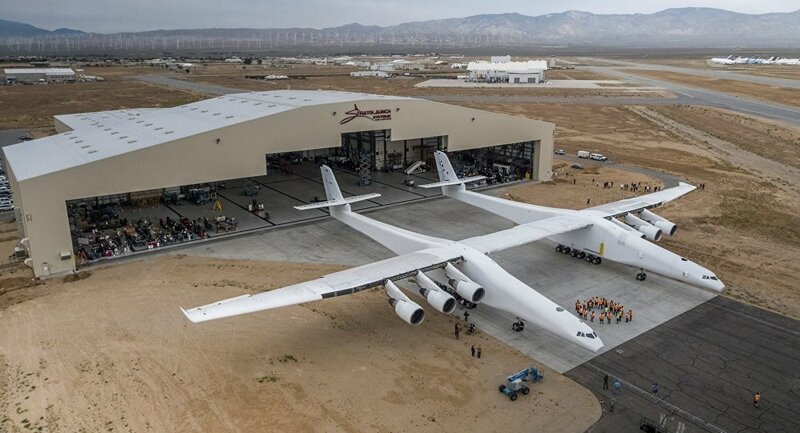 A video of a test run of Stratolaunch, the biggest airplane in the world by wingspan, has appeared online, tweeted out by the Stratolaunch project manager and Microsoft co-founder Paul Allen. In the video, posted on February 26, the gigantic twin-fuselage aircraft, measuring 117 meters (385 feet) from tip to tip, is shown conducting taxi tests at the Mojave Air & Space Port in California. During a series of taxi tests of the plane’s engines and onboard systems, conducted on February 24 and 25, the mothership was brought up to 40 knots, or 46 miles per hour (74 kilometers per hour). Even though Stratolaunch is almost 100-percent composites and its massive wings might be able to take the plane airborne at slower speeds, the six-engine aircraft will still need to double its current taxi speed before it is able to leave the ground. — Paul Allen (@PaulGAllen) 26 февраля 2018 г. ​With a cargo capacity of up to 250 tons, the 230-ton Stratolaunch is designed to carry up to three small rockets to the stratosphere, where it will drop the rockets for aerial purposes to a low orbit around the Earth. The first test flight is scheduled for next year. The giant aircraft is being developed by Paul Allen’s Stratolaunch Systems Corporation — a space transportation venture developing a new air launch to orbit system, with its corporate headquarters located in Seattle, Washington.